[map] Just east of state 57, north of US 98 between Ocean Springs and Gautier. East on Brown Road to Radio Road. 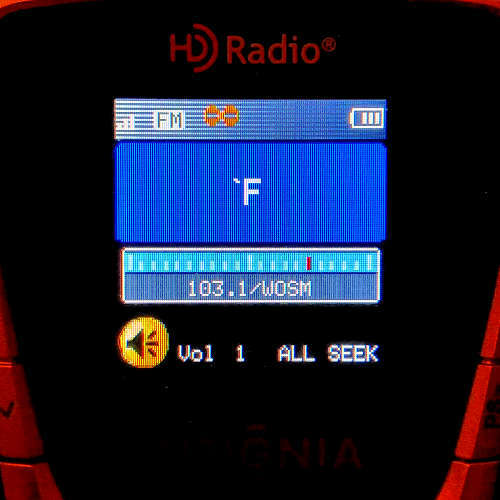 [Image] Image showing the strange RDS data being sent, as viewed on an Insignia HD portable, showing the PI (call sign) and Radio Text fields. [Article] Gulflive article on the reaction to the station changing hands and formats. 103.1 started in 1971 as WOSM (Ocean Springs Mississippi) as a 100% religious outlet, locally owned by Charles Cooper. Same calls, ownership and format continued until the sale of the station to Telesouth in August 2013. Started as a class A, but upgraded to C2 and shows up in Mobile Arbitron ratings sometimes. Owner's wife is a native of Germany and she's on the air quite a bit — her accent was intriguing to listen to. The station had held a permit to increase class, with a power boost to a full 100 kW, with a stick northeast of Pascagoula that would have put a big signal into both the Biloxi and Mobile areas. In July 2013 it was announced that owner Mr. Cooper sold the station to Telesouth Communications, who planned to change the format to their statewide Supertalk Mississippi format at closing. On 26 August 2013 at 6 am, the station flipped to the talk format. In June 2014 the station filed to dismiss the 100 kW construction permit, instead applying for a height increase of just 30 feet from their existing tower. That app was granted and the license to cover filed by the end of November 2014.